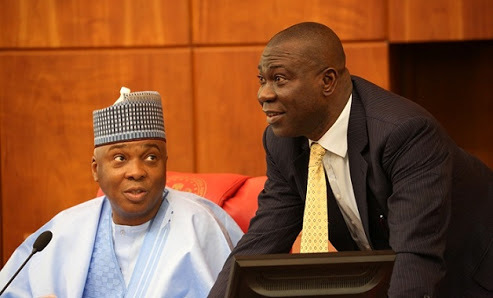 Senate President, Dr, Abubakar Bukola Saraki and his Deputy, Ike Ekweremadu have raised the alarm that the Federal Government has commenced the execution of a plot to implicate them and their colleagues in the People's Democratic Party (PDP) for the last Tuesday Invasion of the premises of the National Assembly by men of the Department of State Services (DSS). In a statement signed by their media aides, Yusuph Olaniyonu and Uche Anichukwu, the two legislative leaders stated that after receiving the interim report submitted by the Inspector General of Police (IGP), Mr. Idris Ibrahim, the Presidency has today constituted a closet panel to review the report and submit a final recommendation. The mandate of this closet panel, the two legislators stated, is to turn facts on the head and blame the invasion of the National Assembly on the two leaders of the Red Chamber of the National Assembly, who will then be presented as having worked in tandem with the sacked Director General of the DSS, Mallam Lawal Daura to stage the parliamentary security breach. "We have been reliably informed that instead of the Presidency to set up a public inquiry or judicial commission to probe last Tuesday's early morning Invasion of the National Assembly as being demanded by the general public, they have commenced a process of manipulation and fabrication. "The Presidency has set up a closet panel, which would work to a predetermined conclusion in which they will now claim that the Senate President and the Deputy Senate President worked in collusion with ex-DG of DSS, Lawal Daura to stage the invasion. "They want to shield the fact that the previous night before the invasion and up till the early hours of Tuesday, there was a meeting of the All Progressives Congress (APC) senators and that the plan was for them to be moved in a coaster bus into the National Assembly complex later that morning for them to purportedly remove us and select a new Senate President and Deputy Senate President. "Their plot only failed because the media, particularly social media, Nigerians and international community responded very swiftly as some legislators who came into the complex were refused entry by gun-wielding, hooded security operatives. "Now, they want to turn the facts on its head and blame us for their botched plot against democracy. We are hereby alerting all Nigerians and members of the international community that the present Nigerian government will stop at nothing to destroy, suppress and incapacitate the opposition. This is their new tactic and plot as we approach the period of the 2019 polls. "We hereby reiterate our earlier position that the coup against democracy as represented by last week’s invasion must be probed through an independent judicial commission of inquiry which will produce a comprehensive report. We reject any manipulated and fabricated investigation,” Saraki and Ekweremadu stated.